Rooted in taste and fragrance – lively ginger gives this blend a spicy kick while golden turmeric brings a grounding balance of warmth and a rich aroma. Ingredients: Organic ginger, organic cinnamon and organic turmeric. My new favourite herbal tea. Love the flavourful blend of ginger and turmeric in this one. It's a really comforting and warming winter drink. New favourite. Kind of warming and earthy. I'm grateful well.ca carries it as I've never seen it in local stores. I love this tea. It has a great kick and I find it helps with my inflammation. 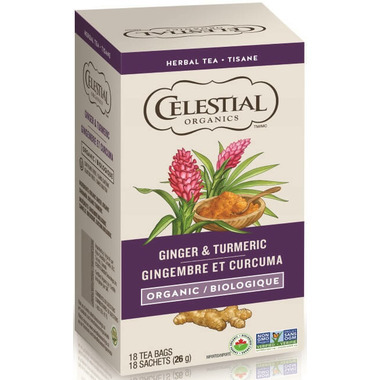 Highly recommended tea to reap the benefits of ginger and turmeric. The tea bags are quite strong.